Mark you calendars because Julia Knight will be back in Laguna Beach August 11. If you're not familiar with Julia, she creates the most beautiful serving pieces in hand cast aluminum with interiors of enamel mixed with crushed mother of pearl. Her collections are themed to flowers like peonies, asters, and lilies; the ocean with pieces multiple shapes of shells and display stands with sea horse bases and Holiday pieces in a beautiful holly theme. The pieces in her classic collection all have mother of pearl inlay to enhance the array of colors and shapes. Please make plans to stop by the second Saturday in August when Julia will be in our store from noon to 3pm signing and personalizing her pieces. We'll have champagne from our Table and Pantry store and Frank will come up with some fun hors d'oeurves. We're offering some very special gifts with your purchase as well. Starting at the $150 level, then $300 and finally $500 or more, we're offering three different sizes of Julia's Peony Vase. If you haven't been to the stores yet, our original Garden & Home store is at 477 Forest Avenue and our Table and Pantry store is across the street at 424 Forest Avenue, both at the corner of Third Street right after you come into town from Laguna Canyon. 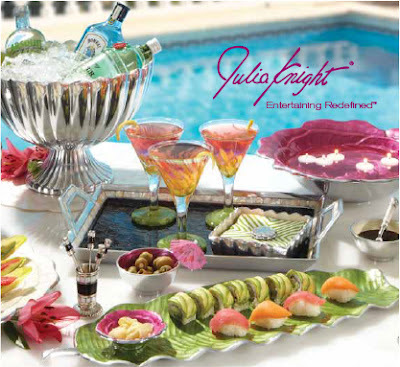 If you can't make the event, you can still have Julia personalize your selections. Just stop by the store, give us a call, or shop the web and we'll have Julia sign your pieces for you. You can pick them up or have us ship them anytime after the event.